“Nom de Guerre” is a French expression which, translated literally, means “war name”. Think “Maverick”, “Ice Man” and “Goose” in Top Gun. From a more historical perspective, think of General Thomas J. Jackson. Almost everyone calls him only by his nom de guerre: “Stonewall Jackson”. Many of our better-known military leaders have had a nom de guerre. In fact, some have had several, which reflect the relative success (at least as perceived by the public) of their military careers at the time the name is conferred. Take for instance General Robert E. Lee. At the end of the Civil War, Lee was so venerated in the South (and pretty much in the North, too) that a small boy, learning about Lee in his classroom, asked his mother, “Momma, I’m confused. Was General Lee in the Old Testament or the New?”  But Lee was not always so lofty a figure in the public’s eye. At the start of the war, Lee was in charge of the disappointing Cheat Mountain Campaign in western Virginia. He was viewed by the public as being too cautious in battle, and was dubbed “Granny Lee”. After this campaign, Confederate President Jefferson Davis reassigned Lee (who had a background with the Corps of Engineers) to supervise the build-up of coastal defenses in South Carolina. This, and the construction of defensive trenches around Richmond earned Lee the sobriquet “King of Spades”, and it was not conferred in a positive tone. These early names gave way later to more positive nicknames later, after Lee’s brilliance as a field commander was established. Later we see him referred to affectionately as “Bobby Lee” and reverently as “Marse Robert” (marse is slang for master). And how about Lee’s nemesis, General Ulysses S. Grant? After the successful investment of Fort Donelson, Grant received a request for surrender terms from the rebel commander, Simon Bolivar Buckner. Grant’s famous reply was “No terms except unconditional and immediate surrender can be accepted.”  The capture of Fort Donelson in 1862 was one of the earliest Union successes in the Civil War, when the North was hungry for good news. The press seized upon the term “unconditional surrender”, and since it fit neatly into Grant’s initials, U.S. Grant became “Unconditional Surrender Grant”. 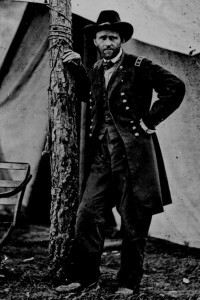 Later, during the long and bloody campaign against Lee in 1864, when the war seemed interminable and Northern morale was flagging, Grant was nicknamed “The Butcher” or “Grant the Butcher” due to the high number of Union casualties, especially at Cold Harbor. 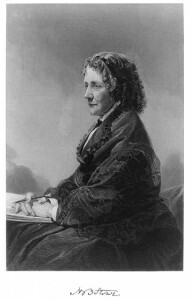 This was not any more descriptive of Grant than “Granny Lee” was descriptive of Lee, since Grant had shown time and again during the war his care of the troops under his command. When Grant was finally able to pin Lee down and force a surrender he offered generous terms, according to Abraham Lincoln’s wishes to “let ’em up easy” and his own inclinations. 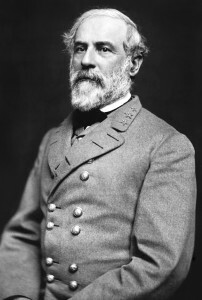 After the surrender he was the “Hero of Appomattox” and once again the darling of the North. In World War II, General George S. Patton was known as “Old Blood and Guts” because he was the most aggressive fighting general in the European Theater. 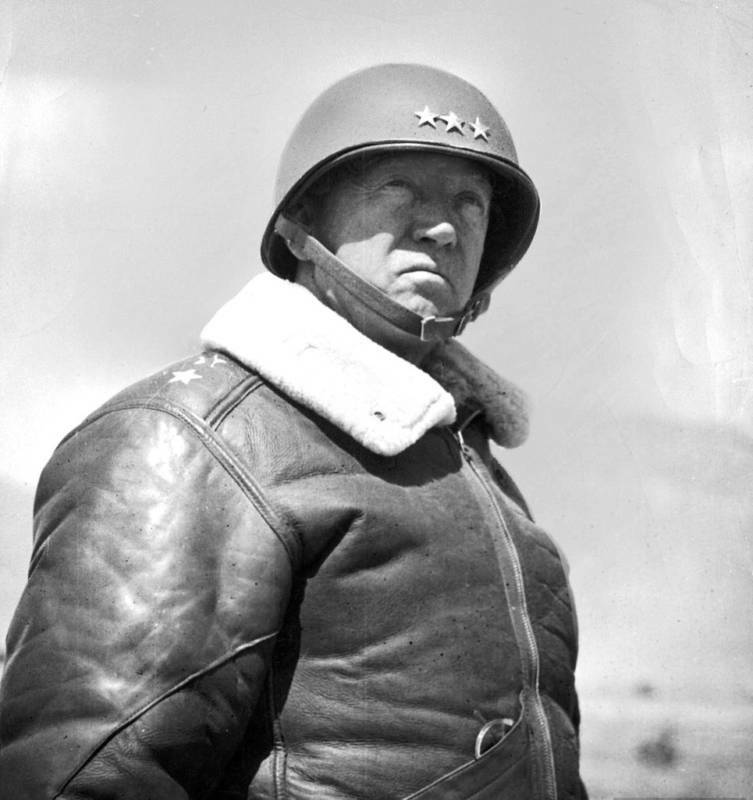 Check out his speech to his troops upon assuming command of the Third Army just before D-Day, and you’ll get a little insight to his approach to war. In North Africa, he squared off against a wily opponent in Germany’s Erwin Rommel, respectfully called “The Desert Fox” by the British. Which reminds me of the unstated rule of noms de guerre. A regular pseudonym may be self-imposed, say for example “Mark Twain”, which Samuel Langhorne Clemens chose to commemorate his days as a Mississippi riverboat pilot (“mark, twain” was the boatman’s call at measuring two fathoms, a minimum safe depth for navigation). Not so a nom de guerre, which must be chosen by your friends, the soldiers under your command, the press, or perhaps by your enemy. I would make a bet that if you took a poll, asking the average Joe what is the worst U.S. maritime disaster, you would get “The Sinking of the Titanic” as the number one answer. I would agree that the RMS Titanic is by far the most famous, but it was not really a U.S. disaster, and not the worst in terms of loss of life (in U.S. History). That grim distinction belongs to the explosion and subsequent sinking on April 27, 1865 of the SS Sultana, a Mississippi River steamboat paddlewheeler. 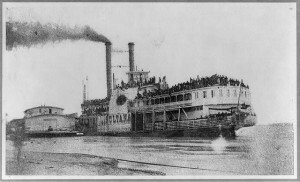 The Sultana was a new, state-of-the-art steamboat, built in 1863. She had been making regular runs up and down the Mississippi from St. Louis to New Orleans during the last two years of the Civil War. On her last trip, she was commissioned by the Federal Government to carry Union solders upriver, on their way home as the war came to a close. In fact, most of the passengers were newly released prisoners of war, from the Cahaba and Andersonville prisons. The high death toll was due to the fact that the ship was dangerously overloaded. She was by law limited to 376 passengers and crew. However, there were thousands of former Union prisoners at Vicksburg, Mississippi, anxious to take the first available ship and get home. The government was paying a lucrative $5 per soldier to get them home, so the ship’s captain, J. C. Mason of St. Louis, was incented to put as many passengers on board as possible. According to some, the military officers were being paid a kickback of $1.15 per person to look the other way and ignore the overcrowding. At any rate, the Sultana was carrying 2,200 to 2,400 people at the time of the disaster, six times the legal limit. So many people were crammed on board they decided not to make out a passenger list. As you can see from the photo taken the day before she sank, the Sultana was packed with people literally shoulder-to-shoulder. Extra stanchions were installed to support the hurricane (top) deck, which was sagging from the weight of the passengers. At Vicksburg, the engineers discovered leaks and a bulge in one of the boilers. Not wanting to lose time and take a chance on another steamboat getting the opportunity to carry the passengers, the captain decided to patch the boiler rather than replace it, which would have taken three days. 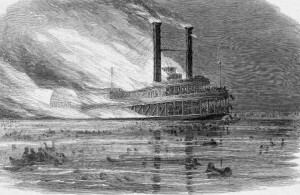 The Disaster: After stopping in Memphis, Tennessee, Sultana started upriver, headed for the next stop at Cairo, Illinois, where most of the passengers were scheduled to disembark. The spring runoff was underway, so the river was high and the current strong, which meant that the Sultana needed a higher than normal head of steam to make her way upstream. The steamboat, top-heavy from too many passengers, was careening from one side to the other. At 2:00 a.m. on the 27th, about seven miles upriver from Memphis, three of the four boilers exploded. The explosion tore a gaping hole in the Sultana and sent burning pieces of coal flying everywhere, which quickly caught the wooden ship on fire. Men were blown off the ship, or jumped into the icy spring water to escape the flames. Soldiers drowned, burned, died from hypothermia, or were crushed when the smokestacks collapsed onto the stricken ship. About 500 men were rescued from the water, of which some 200 to 300 died later from burns, hypothermia, or their general poor health resulting from their captivity. Altogether some 1,700 to 1,800 people died, making it the worst maritime disaster in American History. The Cause: The explosion was likely caused by four factors: the steam pressure was probably abnormally high due to the need for extra power to overcome the strong current. The hasty boiler repairs were inadequate to insure safety. The careening could also have played a part – the four interconnected boilers were arranged side-by-side, which meant that water could flow from the highest boiler to the lowest as the ship tilted to one side then the other. If the water level was not properly maintained, hot spots could develop, where the iron boilers become red-hot due to lack of water, then when the water rushes back it would instantly turn to steam, causing a sudden surge in the overall steam pressure. Why is the Sultana Disaster unknown? When the Sultana’s boilers burst, the nation was inundated with news. Abraham Lincoln had been assassinated, and John Wilkes Booth had been caught and killed on April 26th, the day before the Sultana exploded. Also on the 26th, the last major Confederate Army, under Joseph E. Johnston, surrendered to William T. Sherman. Possibly because of the shady nature of the circumstances around the overcrowding, the Army was not anxious to publicize the story. The public was either tired or desensitized to news of death, having just gone through a war in which at least 618,000 soldiers were killed. Finally, anything which happened in the West received less coverage in Eastern papers. Vox’s Take: Whether the sinking of the Sultana was accidental or deliberate, it was an especially tragic end for the Union prisoners of war who survived incredible deprivation in Southern prison camps, only to be killed when they were so close to getting home. In a small way, the incident helped bring former enemies together: the people of Memphis cared for the survivors and raised funds to help them. One ex-Confederate soldier in a small boat is said to have single-handedly rescued fifteen Union survivors. Perhaps someday this incredible story will find its way into the history books. 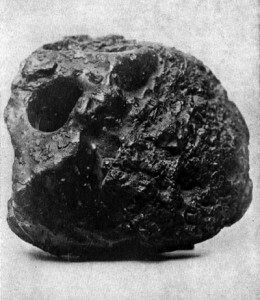 Interestingly enough, the remains of the Sultana may have been found in 1982, 32 feet under a soybean field in Arkansas. The Mississippi River has changed course many times, and the wreckage is now two miles from the current location of the main channel. I love the red, white and blue image of the “Stars and Stripes” against a sky-blue background. Our flag produces a positive visceral reaction for me, as I suspect it does for a lot of Americans. As with any nation’s flag, our flag is more than just the symbol of our country, it becomes a visual representation of our feelings of patriotism and love of home. Certain individual flags, in time of crisis, become a physical channel for our collective passions. Star-Spangled Banner: One of our most famous flags is the Star-Spangled Banner, the popular name given to the 15-star, 15-stripe flag which flew over Ft. McHenry while the British bombarded it on September 13-14, 1814 during the Battle of Baltimore in the War of 1812. The sight of the huge garrison-sized (30 by 42 feet) flag defiantly flying over the fort as the sun rose on the morning of the 14th after an all-night bombardment was witnessed by Francis Scott Key, who was inspired to write the poem “Defence of Fort McHenry”. After being set to the tune of an old British drinking song it became our National Anthem. 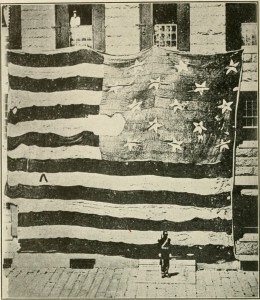 The flag itself was not well treated during the 19th Century. Modern sensibilities about the preservation of historical artifacts were not widespread, and bits of it (including one of its fifteen two-foot-wide stars) were snipped off and given out as souvenirs, eventually reducing the flag’s length by eight feet. 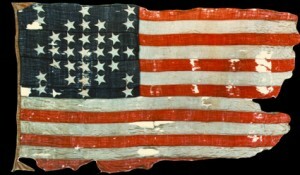 What remains of the original flag is now preserved in the Smithsonian’s National Museum of American History. Ft. Sumter Flag:When the seven states of the deep South seceded following the election of Abraham Lincoln in 1860, Federal installations in the South were marooned. Most, such as Federal armories, were easily accessible to the Confederates and were quickly taken. A few Federal forts in and around Charleston Harbor, however, were isolated from land approaches and remained under Union control. The Union officer in charge, Major Robert Anderson, moved his garrison to Ft. Sumter, in Charleston Harbor, as hostilities became increasingly likely. After Major Anderson refused their ultimatum to evacuate, Brigadier General P.G.T. Beauregard gave the order, and the Confederates fired the first shots of the Civil War at Ft. Sumter on April 12, 1861. On the 14th, after some 34 hours of bombardment, out of food and with parts of the fort burning (but with no casualties), Major Anderson was compelled to surrender. He requested as part of his surrender terms permission to fire a 100-round salute to the flag which flew over the fort, which Beauregard granted. Unfortunately, a shell exploded prematurely on the 47th shot, killing one man and wounding another, and the salute was reduced to 50. After lowering the flag, the Union soldiers were allowed to simply board a ship for the North, taking their ensign with them. Major Anderson was proclaimed a hero in the North, and he and the flag went on a fund-raising tour where the flag was “auctioned” off (and then promptly re-donated by the winner) again and again to raise funds for the nascent war effort. After the four bloodiest years of our history, with the South beaten, (now) Major General Anderson returned to Ft. Sumter with the same flag and raised it again over the fort. The dramatic flag-raising ceremony was on April 14, 1865, four years to the day after the fort’s surrender. Ironically, it was also the night Lincoln became the first U.S. President to be assassinated. Iwo Jima Flag: One of the most iconic images of World War II (or any war, for that matter) was captured by photographer Joe Rosenthal at the height of one of the fiercest fights, the Battle for Iwo Jima. 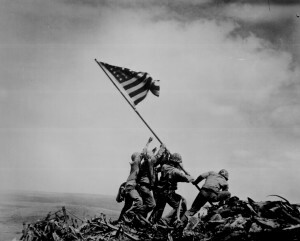 Four days after landing on Iwo Jima, amid terrible fighting, Marines of the 5th Division reached the top of Mt. Suribachi, the highest point on the island. Actually the second flag-raising on Mt. Suribachi that day (February 23, 1945), the moment captured on film was on the front page of newspapers across the country within 18 hours. President Franklin D. Roosevelt immediately saw its value in helping the war effort, and the inspiring image, along with the three survivors of the six soldiers who raised the flag, were soon on a tour to sell U.S. War Bonds. Roosevelt was right: the 7th Bond Tour raised an incredible $24 billion for the war effort, the largest borrowing from the American public in history. To put that amount in perspective, the entire budget of the U.S. Government in 1946 was $56 billion. 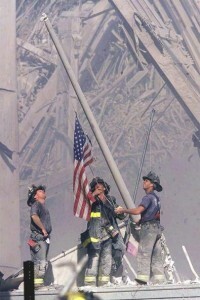 Ground Zero Flag: Out of the tragedy of the September 11, 2001 attacks came a new iconic image for a new generation: the sight of three dust-covered New York firefighters raising a flag on an improvised flag pole at Ground Zero, the site of the World Trade Center. Shot by Thomas E. Franklin of The Bergen Record, the resilience and defiance this photo conveys lifted our spirits even as we mourned the victims of that senseless act of terror. 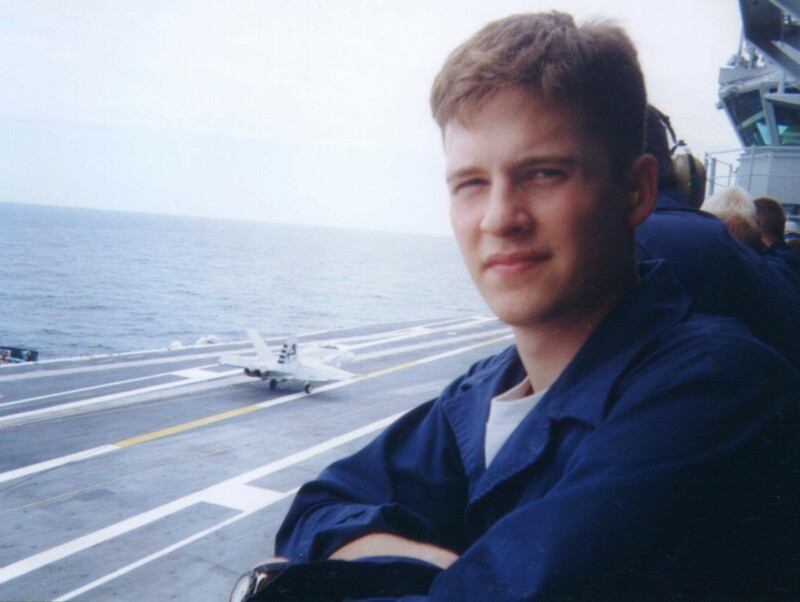 Shortly after the 9-11 Attacks, my son Michael, who was a Damage Controlman (firefighter) in the Navy, deployed on his ship the USS Theodore Roosevelt in support of Operation Enduring Freedom, the War on Afghanistan. 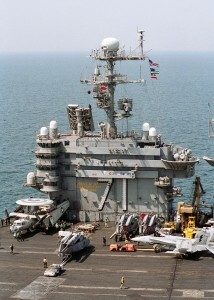 Soon after the ship embarked, the Navy asked to borrow the Ground Zero Flag, and so New York City lent the flag to the Navy who forwarded it to the Theodore Roosevelt, then in the Arabian Sea supporting the air war in Afghanistan. On September 30, 2001 a ceremony was conducted on board the Theodore Roosevelt wherein the Ground Zero Flag was presented to the Theodore Roosevelt firefighters. I’m proud to say that Michael was one of the firefighters to participate in that ceremony. On this deployment, the Theodore Roosevelt remained at sea for 159 consecutive days, longer than any warship since World War II. I remember Michael saying they worked 16 hours a day for 79 straight days before they got a day off. When the guys on the ground need air support, they need it now. While participating in Operation Enduring Freedom, the Ground Zero Flag was flown from the Theodore Roosevelt’s halyards, an especially poignant reminder to the sailors and airmen what we were fighting for, and an especially “in-your-face” reminder to the Taliban what we were fighting for. At the end of Theodore Roosevelt’s deployment, the flag was formally transferred back to police and firefighters representing New York City. There’s a sad footnote to this story, however. In August 2002, New York City lent the flag back to the original owners prior to its transfer to the Smithsonian. To their dismay, the owners realized that the flag the city returned to them was not the flag taken from their yacht the Star of America and hoisted by the firefighters at Ground Zero. They have tried to force New York City to find the original flag, but so far have not met with success. Vox’s Take: I think it’s a shame that the original Ground Zero Flag has been lost, just as it’s a shame part of the Star-Spangled Banner was cut up for souvenirs over 150 years ago. I hope the Ground Zero Flag can be found. Despite this, both flags have served their purpose, and the images they have given us, which can never be lost, are just as powerful as the actual artifacts. 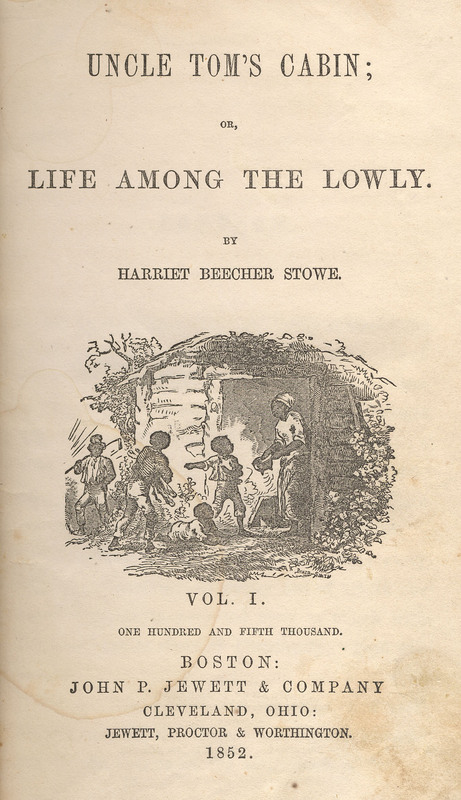 While it is certain that Uncle Tom’s Cabin had a positive social impact in terms of shifting Northern attitudes more strongly against slavery (and possibly helping secure Lincoln’s election in 1860), the book is viewed today with mixed feelings. This is because it inadvertently helped create a number of stereotypes about blacks, some of which persist today. 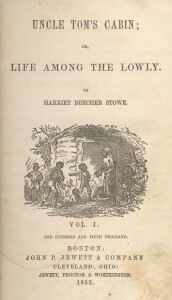 These include the “Uncle Tom” stereotype of the long-suffering but loyal black man who is devoted to his white master, and the “Mammy” archetype of the loud and overweight but good-natured black nanny. Vox’s Take: From our 21st Century viewpoint, it may be hard to understand how deeply racist our country has been throughout our history, and that for much of that history it was a social norm, not an individual’s character defect. We tend to think that a person such as an abolitionist, who was passionately opposed to slavery, was automatically a believer in racial equality. But that’s not how folks thought back then – views were much more complex than that. There were believers in racial equality at the time of the Civil War, but this viewpoint was radical and on the fringe. The great majority of people, even those opposed to slavery, took it for granted that the black race was inferior to the white. Those beliefs, widespread and entrenched as they were, took a long time to change. That’s part of why there’s 99 years between the 13th Amendment abolishing slavery in 1865 and the Civil Rights Act of 1964, which finally began to codify equality in the law.